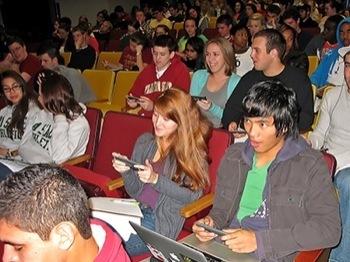 Students in a large class using clickers. The overriding goal of teaching with clickers is to achieve better student learning. With adoption, many other benefits will accrue to both the instructor and students. Imagine yourself as a freshman in a 500-seat auditorium taking a subject you've never had before. After the professor lectures for 10 minutes on the difference between two key terms, she pauses, looks intently around the room, and asks "does anybody not understand the difference between these two terms?" You don't fully understand but think you're the only one. You're too intimidated to raise your hand. Now imagine yourself as a freshman in a 30-seat class with the same scenario. The professor and most of the students probably know your name, or at least you're more recognizable than in a big class. You still don't want to raise your hand because now everybody will know that you don't know the difference. Both times you say nothing and hope you can figure it out later. A clicker question will allow you to answer the question and really find out how much you know. Perhaps you really do know the difference and just need a question and correct answer to confirm it. Perhaps you really don't know. The clicker question allows you to answer incorrectly, but anonymously, and avoid the shame and embarrassment you might feel by raising your hand in class (either big or small). As the instructor, you need to determine what you want a Classroom Response System to do for you, your students, and the classroom environment. You can adopt a formal or informal style, make the technology mandatory or optional, and implement the technology in many different ways. It all depends on what you want to get out of it. Here are some benefits instructors are currently receiving by adopting clickers (some may be received simultaneously- they are not mutually exclusive). A Classroom Response System offers many opportunities to combine the technology with other teaching pedagogies including ConcepTests, Just-In-Time Teaching, Cooperative Learning, Interactive Lectures, Classroom Experiments, and Interactive Lecture Demonstrations. In addition to the information found here, the University of Colorado Science Education Initiative (CU-SEI) and the University of British Columbia Carl Wieman Science Education Initiative (CWSEI) have produced a set of videos about using clickers in the classroom, including one summarizing the research showing that clickers help students learn. Stunning evidence about the effectiveness of clickers in "Improved Learning in a Large Enrollment Physics Class"
What is a Classroom Response System?